Been diving in Three sisters? Please Vote! 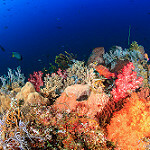 Now here is another fantastic dive site that is pristine, brimming with life and flourishing with corals. The site is named after the three large rocks, the three sisters that are joined to one another with ridges, along the bottom at around 30 meters. They rise up and reach about 5 meters below the water surface. They have often been said to be hard to find, so it is best to use GPS to find the dive site. There is also a fourth sister that is a bit further away from the others; this sister is worth a visit just to see the amazing sea fans and excellent marine life surrounding it. Visiting the fourth sister can be tricky, as you may need to cross a large part of open water with some level of current. This should only be done by experienced divers. At the bottom of the three rocks are smaller boulders, which host many different types of nudibranchs, starfish, and sea cucumbers. They are joined out in the open blue water by pelagic fish and reef sharks. The three sisters are about ten meters apart so it is very easy to swim to each of them, but it is worth it just to explore the different parts of the dive area. Excellent drift dive located north of Komodo island. Beautiful pinnacle and reef dive site. Amazing drift dive running through 15m to 30m deep canyons. Samata offer liveaboard diving trips to Komodo Islands, Raja Ampat and Banda Islands as well as accommodating tailor made cruises. Bidadari liveaboard articles goes here. The Cheng Ho liveaboard is one the most luxury liveaboard sailing between Komodo and Flores. This superb liveaboard goes to Komodo, Raja Ampat and the Forgotten Islands for some amazing diving. The MSY DAMAI 1 is one of the best liveaboard sailing the Indonesian archipelago. The M/V Seven Seas is one of the top luxury liveaboard sailing the Indonesian top diving destinations. The MSY Arenui is a luxury boutique liveaboard offering a five star service. Komodo is a very popular choice amongst divers, and for good reason! Strong currents are prevalent in some areas, making drift diving one of the more highly sought-after experiences. These biodiverse waters offer regular sightings of reef sharks, turtles, manta rays and plenty of schooling fish as well as macro life and critters for those with a keen eye. Map of Komodo, Three sisters dive site.